This is one of those mysterious recipes in which the sum of the whole is much greater than the parts would suggest. Kimchi, fermented vegetables usually served as a side dish, is a staple of Korean cuisine, while mayo is about as western as a condiment can be. Put the two together and gustatory magic happens. If only international diplomacy were this satisfying. If you aren’t familiar with Gochujang, it is a traditional sweet/spicy, garlicky, umami-laden red pepper- based Korean condiment that has taken the culinary world by storm. If you like Sriracha, chances are good that you’ll love gochjang, and in fact you could probably even substitute Sriracha for Gochujang if you wish. We used only enough Gochujang to add another subtle layer of complexity to the dish without having it compete with the kimchee’s own multi-faceted flavors. If you’re going to use commercial kimchi (we did) there are an infinite number of brands available at most supermarkets, and certainly stores that specialize in Asian foods are well stocked with it. We used Sunja’s “Medium Spicy,” which we bought at our local Whole Foods market. 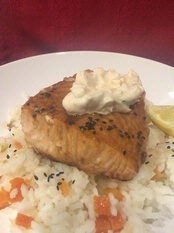 Serve the salmon with Calrose or sushi rice, or other short grain rice. We pre-cooked a little mirepoix of diced onions, carrots and celery to stir into the rice after it was cooked, but plain rice is perfectly fine. Cut the salmon into 4-6 pieces and arrange them, skin side down, in an oven-proof baking dish large enough to hold them in a single layer. Mix together the soy sauce, wine, sesame oil and lemon juice, plus the fish sauce and Gochujang (if using). Spoon the mixture over (and under) the fish. If you have time, cover the dish and refrigerate it for 2-4 hours. Dice the kimchi and combine it with the mayonnaise. Refrigerate until ready to use. When you are ready to cook the salmon, preheat the oven to 375°. Roast the salmon, uncovered, for about 15-20 minutes. To serve, place each piece of fish on a serving plate, peeling the skin off as you go along. Top each serving with a sprinkling of sesame seeds (if using) and a healthy spoonful of the kimchi mayo. Pass the remaining kimchi mixture at the table. This is a somewhat tricky dish to pair successfully with wine. Color doesn’t much matter, but body and flavor do. We tried a crisp Pinot Grigio, which got completely lost in the pairing. By contrast, an oak-laden Chardonnay tasted solely of wood, the fruit having seemingly disappeared. With reds, notable tannins proved off-putting, as did overt sweetness (dooming the two Pinot Noirs we sampled). Look for wines, then, with medium-weight texture and full but not brawny flavors. Let the wine meet the dish halfway, and the match should be quite satisfactory. Tasting of apricots and pears, this unoaked Chardonnay exhibits a slightly metallic edge in the finish, giving it a genuinely Tuscan character. That non-fruit element keeps it focused and allows it to show its charm even when sipped with the spicy kimchi mayonnaise. Soft and spicy, with an echo of pepper and dried herbs, this red Côtes de Rhône offers plenty of fruit but not all that much power, making it versatile enough to work with a dish like this. A more robust Rhône red would seem overwhelming. An old-fashioned Rioja, this is a light, almost pale-colored red, with abundant flavor reminiscent of cherry fruit, sweet pipe tobacco, leather, and savory spice. It starred with the dish as all those flavors added complexity while never threatening to steal the limelight. An impressive California Sauvignon, with true varietal character, but a fuller body than most renditions from New Zealand or the Loire. That body accompanies a richness of flavor that allows it to stand up to rich dishes like this one. This rosé simply loved being paired with the spicy kimchi. Perhaps because it’s made with Cabernet Franc, it has some heft and never seems ephemeral. The wine does carry more than a hint of sweetness, but it worked because its ripe fruit flavors complemented the kimchi mayo so well.